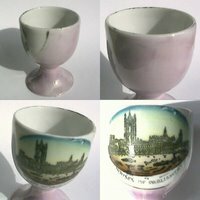 Marketing egg cups as souvenir objects was a great contribution for the popularity of egg cups. 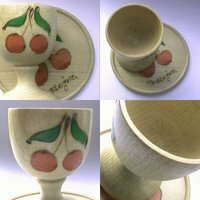 Indeed, their small size and light weight makes them a very practical choice, and they have been used as 'souvenir' for decades and decades and in a wide variety of locations. Cautious travellers do prefer them in resistant materials such as metal and wood. 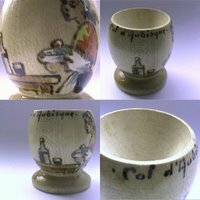 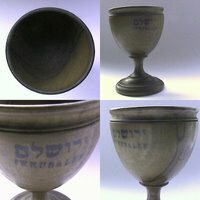 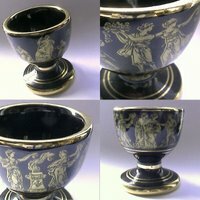 Collectors have a preference for unique designs, as well as a particular sensibility for general accordance between the style of the egg cup and the place or monument to be remembered. 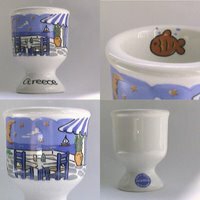 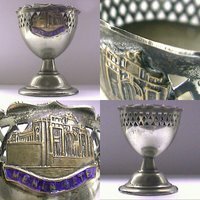 Tourist information: 1) Greece [eggcup1819]; 2) Postojna (Slovenia) [eggcup0576]; 3) Creete, with "hand made" mark, probably marketed by Neofitou [eggcup0513]; 4) piece illustrating the souvenir egg cups known as 'pinklustre', souvenir of the UK's Houses of Parliament [eggcup4598]; 5) Col d'Aubisque (France) [eggcup1458]; 6) Menin Gate (Belgium) [eggcup0898]; 7) Jerusalem [eggcup0640].